Hokkaido has gotten attention from many Asian tourists in the last few years. 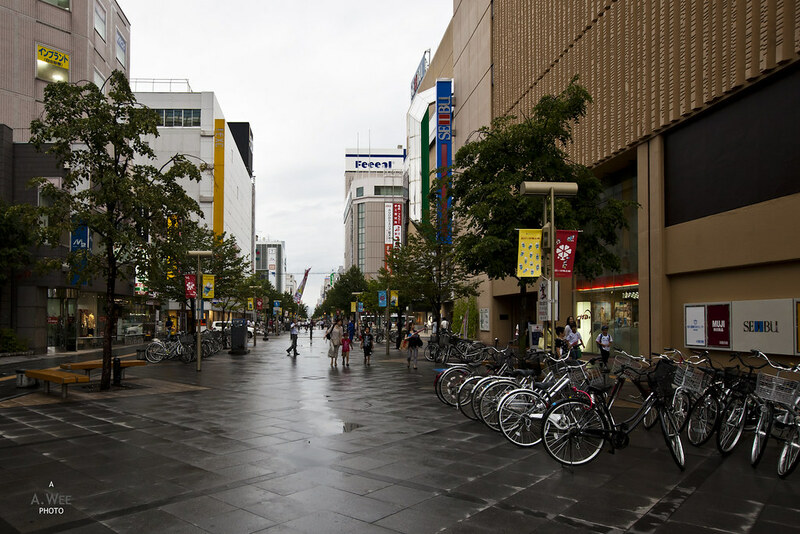 Compared to the main cities of Tokyo and Osaka which can be very expensive, Hokkaido can provide more value for money in addition to much more natural attractions that draws urban dwellers. In the winter time, many of Hokkaido’s ski resorts provide much fun for snow sports enthusiasts, and during the summer months, the area around Sapporo provides a respite from the heat of the cities. 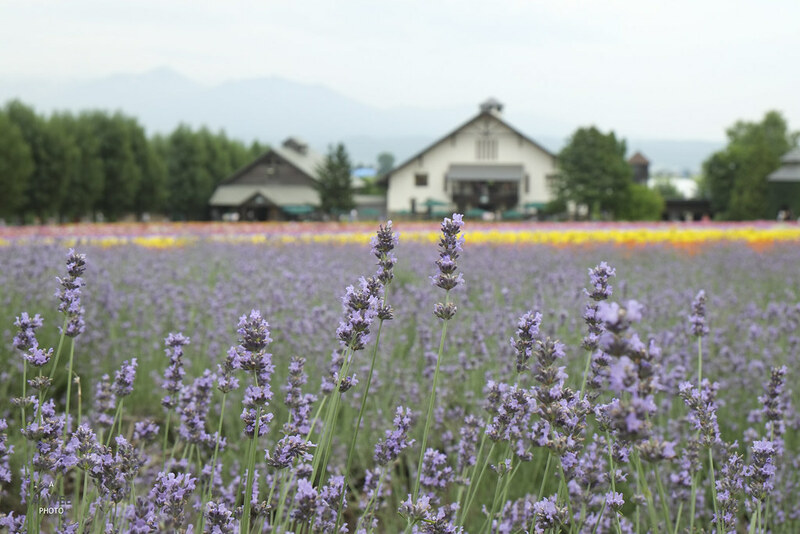 Since we were travelling as a family, I revolved the itinerary around Furano and Asahikawa. Furano 富良野 and Biei 美瑛 are two cities connected by an antique train car that operates during the summer months. 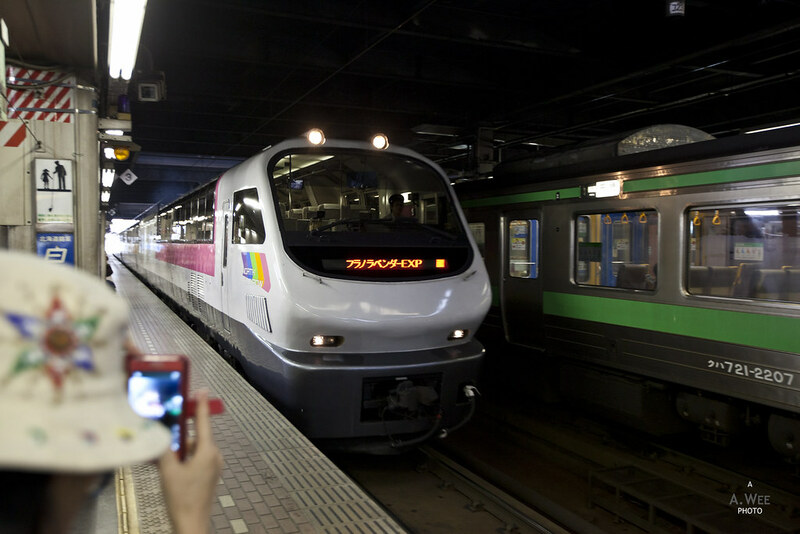 JR Hokkaido actually has a special round-trip ticket that creates a model itinerary for travellers. This leaflet from JR Hokkaido probably makes it a lot easier for travellers that seek to visit this area. We boarded the only Lavender Express train from Sapporo that takes us directly to Furano early in the morning at around 9am. We did not reserve seats but had no problem getting 5 on the upper deck and it was a nice journey that took us to Furano in about 2 hours. 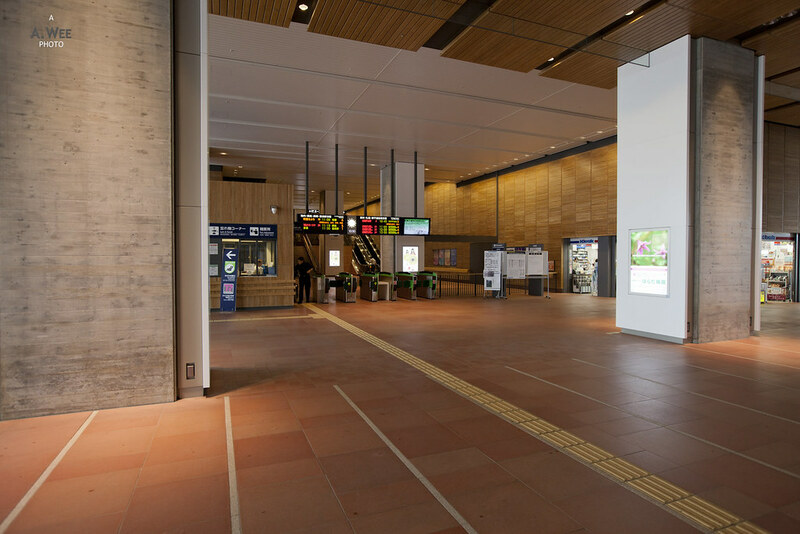 Unlike many other train stations in Japan, the station at Furano shows that one is indeed in the rural countryside since there was no escalators to carry passengers to the station opposite. This can be daunting for tourists bringing luggage since they need to take the stairs to the main entrance/exit of the station. Once there, we had some time to spare for a bathroom break and a visit to the local tourist office before boarding the Norokko train that plies between Furano and Asahikawa. Our first stop for the day was to visit Farm Tomita, a large farm that is about a 5 minute walk from the makeshift Lavender Field Station which is only operated during the summer months. The entrance of Farm Tomita is a large visitor centre and sells melons which are a specialty of Hokkaido. 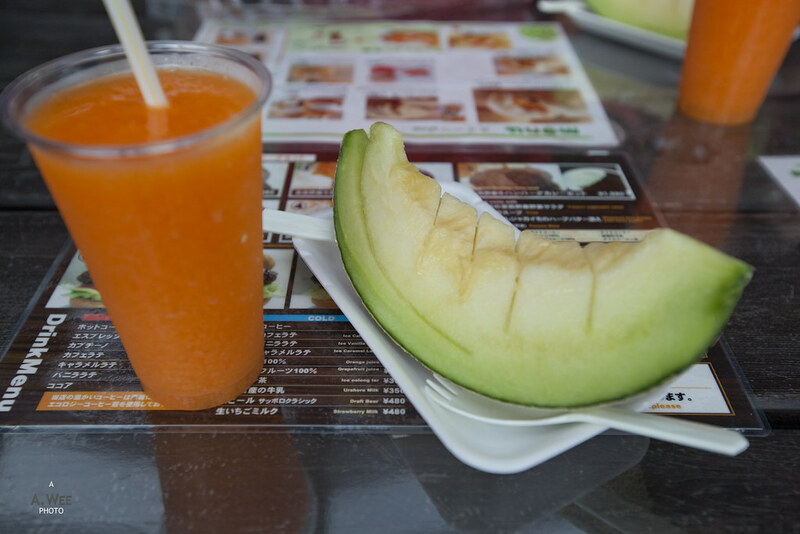 Since we were pretty hungry and thirsty after the long train ride, it was time to have a snack of melons and have a refreshing melon juice. And it was perhaps the highlight of visiting the farm since the melons were some of the best I have ever had. I would definitely recommend a visit to this farm during the summer months. 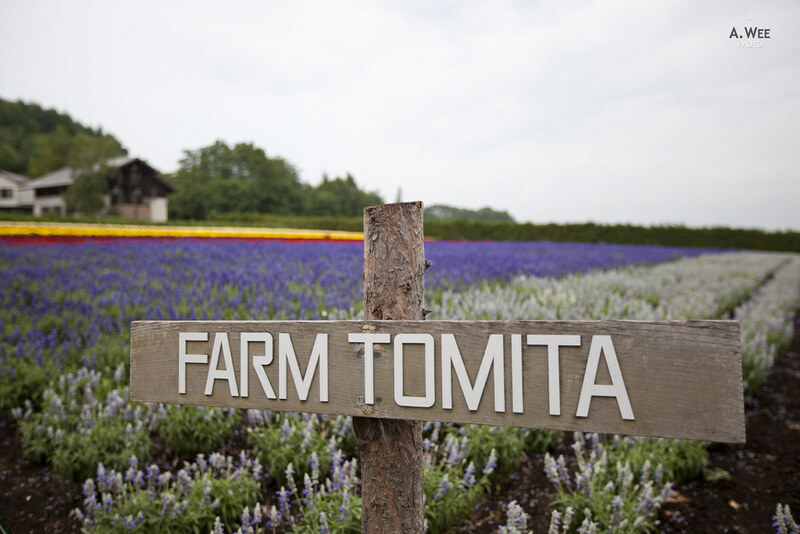 Another reason to visit Farm Tomita is perhaps to take lots of photos amongst the lavender fields that would be in full bloom sometime in August. The fields definitely makes this part of Japan look like the Provence region of France. 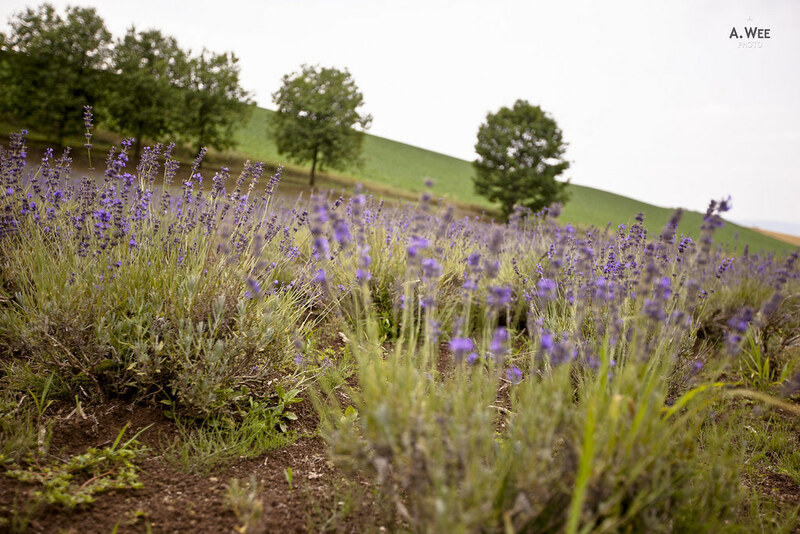 Tourists can also buy a variety of gifts and souvenirs made from lavender as they walk around the grounds of the farm. As the farm is not exactly large, it makes for a nice leisurely walk amongst the subtle scents of lavender. At the end of the visit, get some lavender ramune or soft serve ice cream that would definitely be a delight for the young and old! We spent roughly around 2 hours in the farm by eating, taking photos and enjoying the scenery. From there, we returned to the temporary station to re-board the Norokko train to Biei. 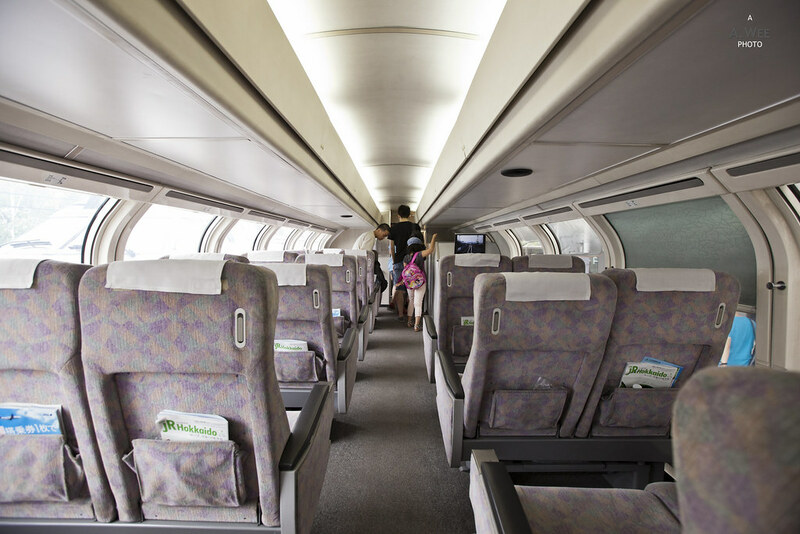 Taking the Norokko train is perhaps another highlight for touring the Furano and Biei area as it is an open air train that chugs along slowly allowing travellers to take in the fresh air of the Hokkaido countryside. Unlike Furano, Biei is a very neat town with some quaint architecture. Though our purpose of visiting the town was to take the Twinkle Bus along the Takushinkan course. This course allowed us to visit the Takushinkan photo gallery which has features very nice landscape scenery of the area taken by a father and son photographer team. We were given around half and hour to spend in the gallery and to explore the surrounding area which had more lavenders. The other major stop along the route was to stop by the Shikisai-no-oka or the Hill of Seasonal Colours which is another huge attraction with a market that sells many Hokkaido vegetables and specialty snacks at the entrance. There are also 2 straw figures in the hill that offers photo opportunities for visitors. 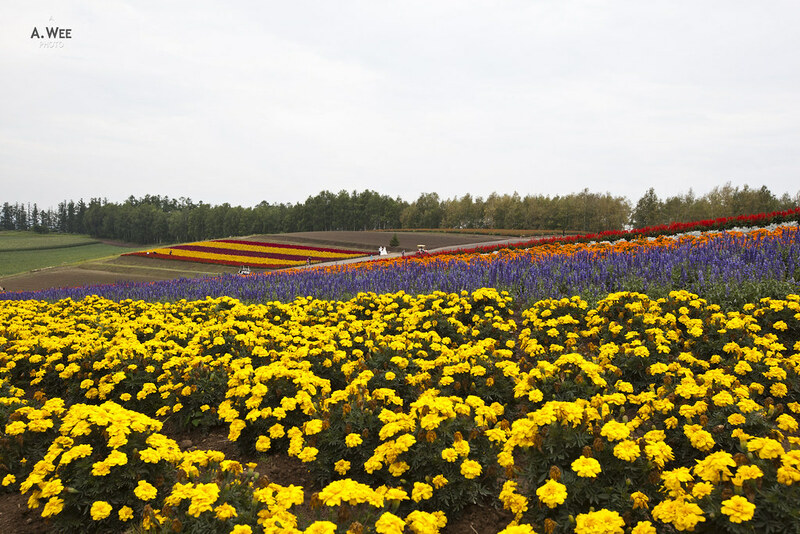 While this was more or less similar to the flower fields in Farm Tomita, the incline and gradient of the hill as well as the fact that there was a greater variety of colours made it more beautiful. A 40-minute or so stopover in the hill allowed us sufficient time to hike around the hill and even get some snacks for the remaining bus journey. From Biei we boarded the Norokko train once again to Asahikawa before transferring to the JR train back to Sapporo. Due to Asahikawa and Furano being relatively smaller towns, I had decided to stay at Sapporo instead as that will give us time to shop and eat during the evening for both days while exploring Furano and Asahikawa. 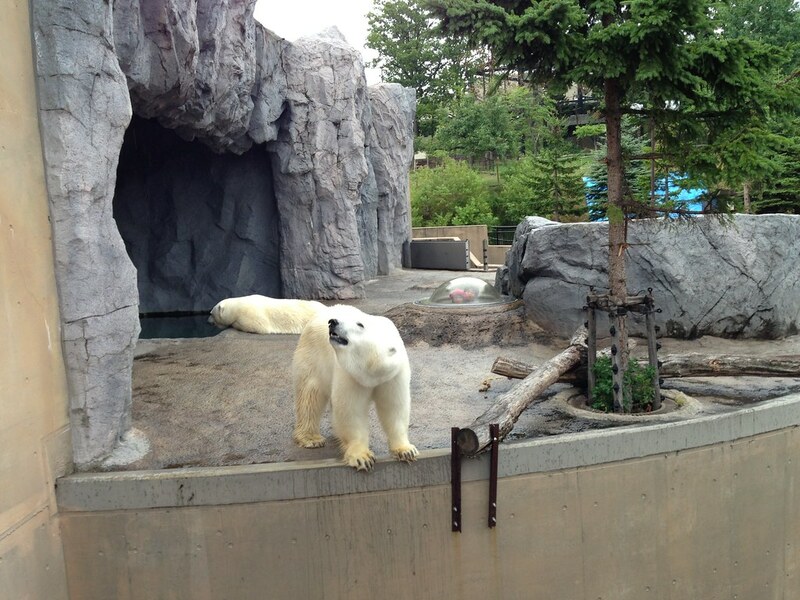 As expected the next day was spent at the Asahiyama Zoo, which is considered to be one of the best zoos in the country. However, the tickets for the special Asahiyama Zoo train was sold out early on so we just boarded the standard limited express to Asahikawa and transferred to a local bus to the zoo. It was a nice comfortable journey except that the weather that day was raining and this dampened the mood slightly. 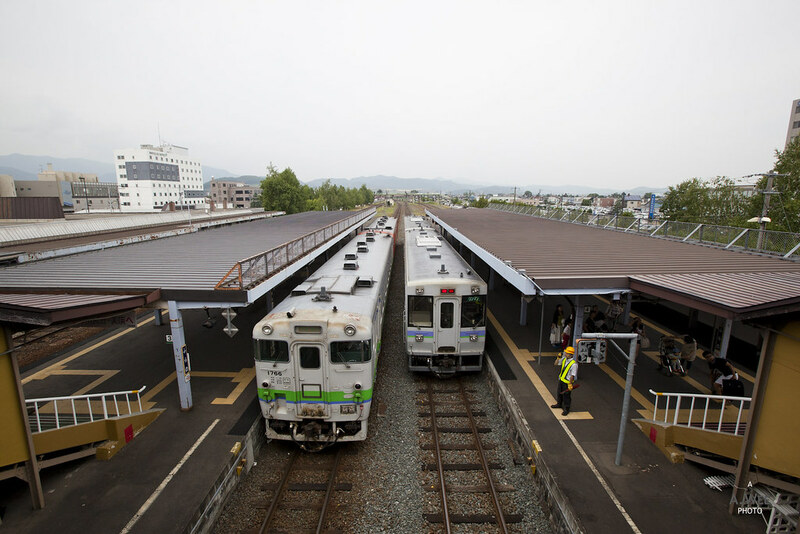 Arriving into Asahikawa station was a different experience again as it was a very nice modern station and the bus stop for the zoo was just a 5-minute walk away from the station. Fortunately on arriving at the zoo, many of their popular attractions are sheltered. This includes the seal and polar bear enclosures. They are definitely recommended for the ability of visitors to view these creatures from vantage points. Some other interesting sights in the zoo includes the wild animals section and the sole snow leopard in the zoo. The zoo is also notable for their red pandas, the smaller racoon-like animals that are as cute as their larger relatives. 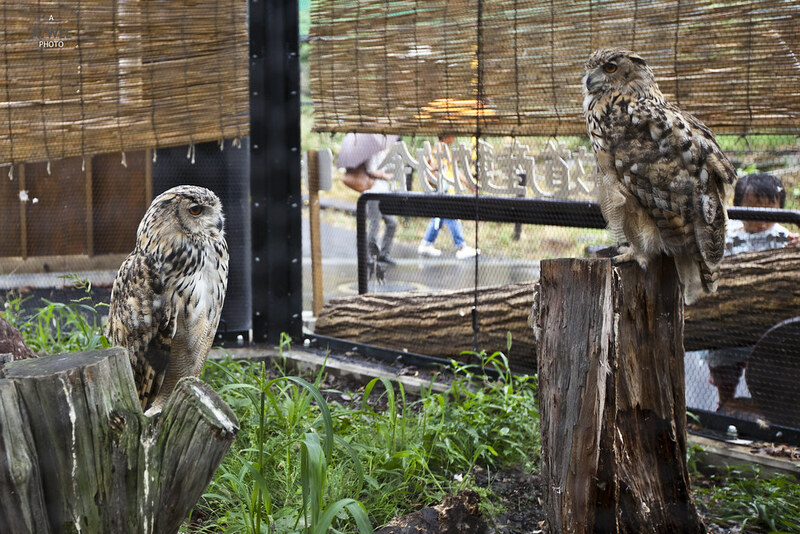 Other sights not to be missed includes the owls and wildlife of Hokkaido. 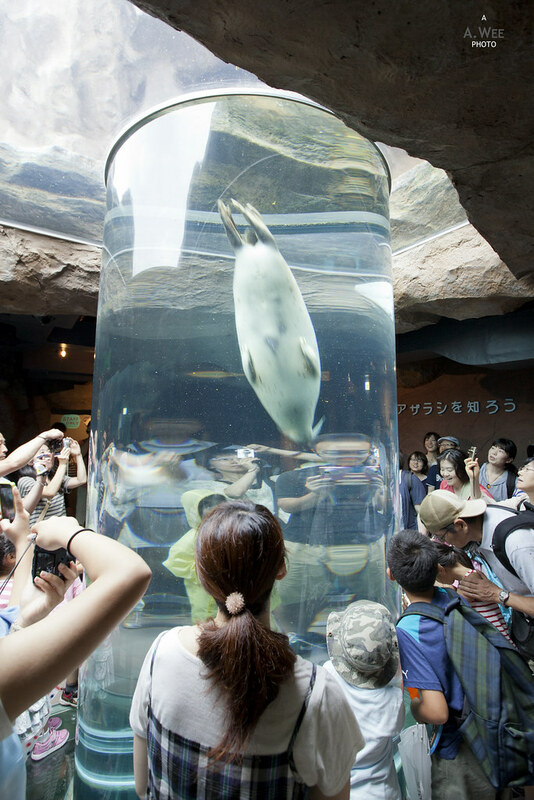 It is not a large zoo, though there are surprisingly large crowds visiting the attractions. This could mean some time queueing to get vantage spots for photo opportunities so do be patient. There also seems to be a lack of dining options with the main restaurant being near the polar bear enclosure though there are numerous snack stalls around the zoo which is easily covered in 2-3 hours. In our case, we decided instead to have lunch in town and queued up for the bus which again is recommended. Try not to take the last bus as the queues get larger towards late afternoon. A visit to Asahikawa is not complete without getting a bowl of ramen since one of the most famous ramen chains, Santouka, started originally in this town. Their main branch is located not far from the main train station and the small town is also a pleasure to walk around in. During the time we visited Asahikawa, there was also a night market lining the pathway to the train station and had we stayed longer until the evening, we would have gotten some more snacks there. Generally, both Furano and Asahikawa provides a very nice excursion away from the cities in Japan and is a family-friendly destination where one can experience tasty Japanese cuisines as well as explore the natural wonders of Hokkaido.